For availability, contact us direct or view our listing on HomeAway. Ramscombe Cottage is situated in a quiet rural location at the end of a single track 'farm' lane on the edge of St. Catherine and to the north side of Little Solsbury Hill. We are approximately 4 miles from Bath City centre, and approximately 1½ miles from the nearest bus stop. There are many pleasant and interesting walks in the immediate vicinity. 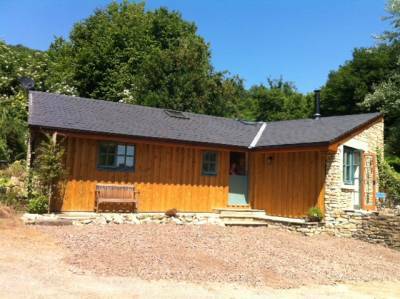 We offer a one bed-roomed barn conversion for holidays and short breaks. From Bath take the A4 towards Chippenham and follow the signs for Batheaston. At Batheaston take the left turn signed for Northend and St Catherine. Drive through Northend and carry onto a single track road. Take the next left turn into Hollies Lane and proceed up the hill and turn left, at the crossroads, into Ramscombe Lane. Ramscombe Cottage is around ½ mile on the right. Our postcode is BA1 8EP which we share with our neighbours. Your satnav should bring you to the crossroads between Ramscombe Lane and Hollies Lane. If you have come up Hollies Lane you'll need to turn left into Ramscombe Lane and our Cottage is to be found ½ mile on the right. If approaching Bath from M4 J18 on the A46, the satnav often direct drivers to turn left into Leigh Lane where signed for St Catherine. This route to the cottage involves travelling around 3½ miles on a single track road. The alternative is to carry on the A46, following the signs for Bath, until the roundabout over an underpass at the bottom of a long hill. At this roundabout turn left for Batheaston and follow directions as above. The nearest bus stop, which has a regular service to Bath City, is in Batheaston and around 1½ miles distant. Taxis from Bath City centre cost in the region of £12 - £15.